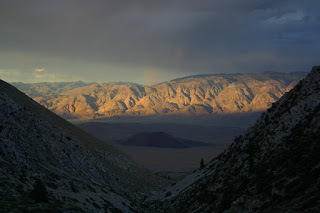 Just West of Bishop you will find Little Egypt; a similar environment to J-Tree, with the high desert feel and sweeping views of the huge Sierra peaks, Mt. Tom, Basin, and Humphreys. 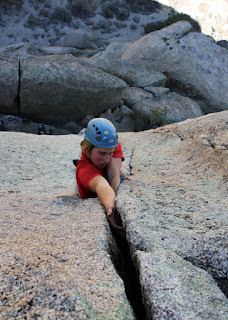 We came to climb the cracks: rough, gritty and spectacular! 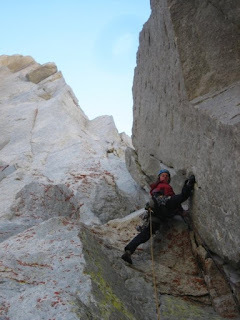 Pine Creek Canyon just North of Bishop hides a vast expanse of granite towers and gullies, the premier venue being the Pratt's Crack Gully. 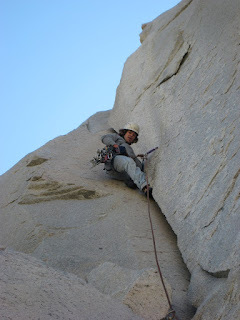 Here is the best rock and an awesome setting, 400 ft granite walls above a narrow vegetated slot in the canyon cut by the stream. 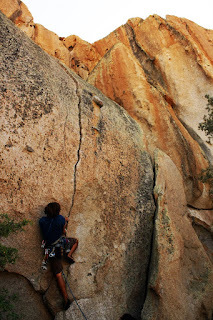 Max and I climbed 'Rites of Spring', an excellant crack line with four pitches of great jamming! I also re-opened my knee gobie from the 'Cardinal Sin' OW!! 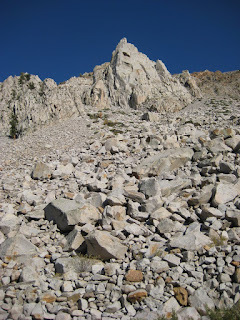 Just West of Bishop is this immaculate chunk of white Sierra granite, the good stuff! 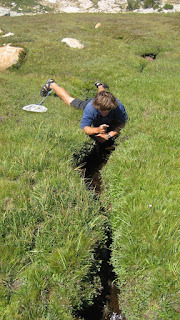 Max found us a great OW to play on, really good knee-locks (I've got a gobie) and hand-fist stacking! 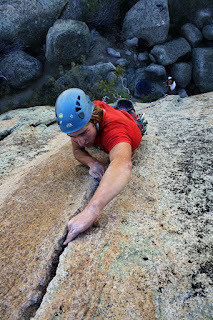 There are many excellant cracks here, the B-H Finish is a stellar thin hands crack with awesome exposure...we'll be back! 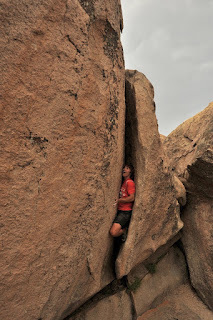 Nick and I have returned from our car to car effort on The Hulk, trying to climb new terrain for both of us on the Astro-Hulk route. 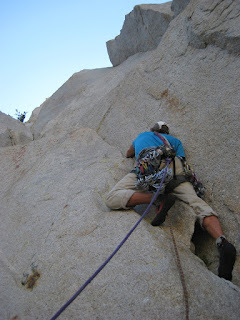 The weather was as good as the Sierra gets, not a cloud and a slight breeze to keep the sun pleasant. 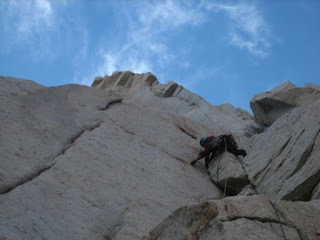 After climbing the first four pitches of Positive Vibrations to the bivy ledge, we began looking for the route with only a vague description. 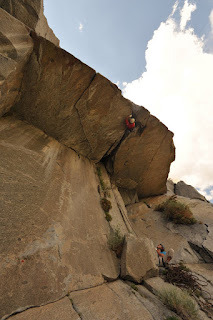 Not really sure where the line goes, but we climbed some good corner systems for a few pitches before bailing back to the ledge...all in all a grand adventure filling in the gaps on this amazing hunk of granite! 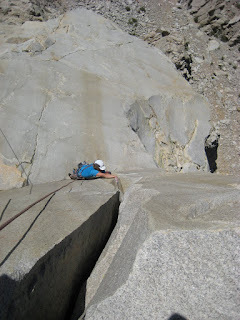 By the time we got back to the ground I was totally worked and even managed to puke up some food and water! 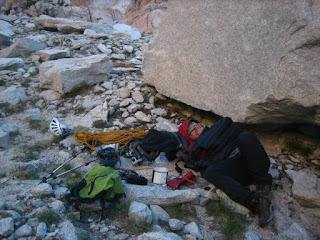 (Don't forget your electrolytes) Stumbling back to the car at 8pm rounded out the mission, I think I'll camp next time! Weird slot at the Druid Stones, still waiting the send! Need pants, long sleeves, high tops! 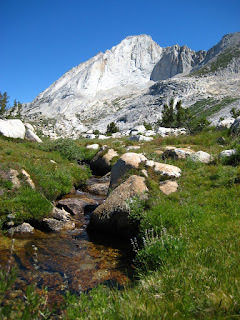 My quads and calves are bulging after two months of hiking all over the Sierra for work and play! 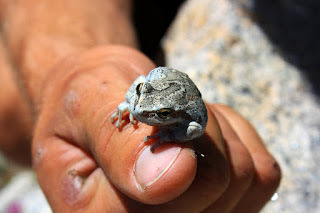 The weather in Cali has been unusually cooler and wet making for some interesting froggin trips. 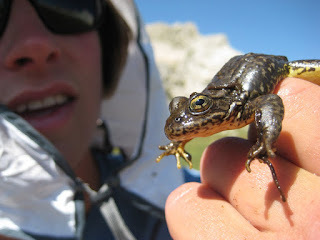 I'm working on a National Science Foundation funded grant through UC Santa Barbara studying the amphibian chytrid fungus' effects on the Sierra Yellow-Legged Frog. 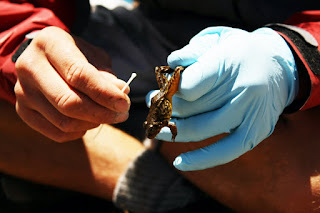 Check out mylfrog.org for more info. On days off, we rest our legs and pump out our upper bodies on offwidths! I'm real excited to head back to the Incredible Hulk with Nick for a few days off!